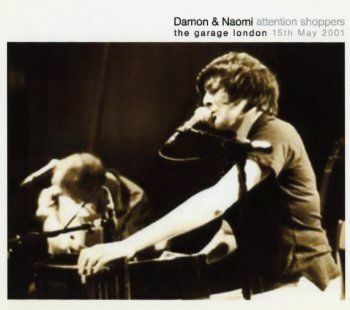 I don't have many recordings of Damon & Naomi - at most gigs since this one in 2001 my taping buddy hasn't been able to tape for various reasons (and had one failure - and doesn't come out so often these days). This was a great show, support had come from The Clientele (first or second time I'd seen them) and The Trembling Blue Stars (sadly neither of their sets were taped). Damon & Naomi were over with Michio Kurihara on the tour that would end with the "Live in San Sebasitan" deception (go read your Sub Pop Years liner notes). I didn't often bother making sleeves for the recordings I have, but I did for this one. The picture was not from London but from Holland (I think) on the same tour, and was from a set sent to me to put on the website by the photographer Stefan Claudius. I didn't get permission to bung it on my CD sleeve but then it was never meant for sharing. Stefan's photos also turned up in the "Song to the Siren" CD booklet. Anyway... great show - you can see my original review here.